Today’s unsung post season hero, the late Paul Lindblad, had a long career where he seemed to bounce back and forth between the Athletics organization and the Senators/Rangers organization before wrapping up his career with a cameo in the Bronx. Along the way he picked up a few World Series rings and played along side a bunch of Hall of Famers over 13 seasons. 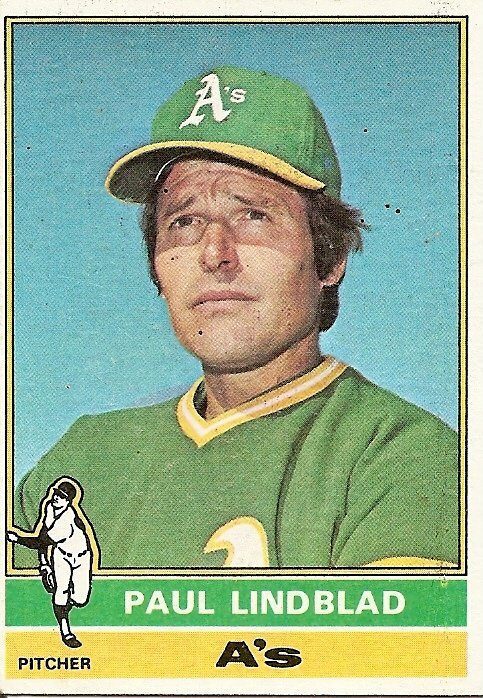 In 1973, he found himself back in Oakland helping the defending World Champs against the upstart New York Mets. Two future Hall of Famers, Catfish Hunter and Tom Seaver, started Game 3. A Seaver win would give all the momentum to manager Yogi Berra and the Mets. And an A’s loss would keep the team in an emotional spiral. A lead off homer by Wayne Garrett and another run put the Mets up 2-0 in the first. Seaver kept the A’s off the board until the 6th. Oakland tied the game in the 8th but could not score in the 9th against the Mets bullpen. Williams, having already used his best lefty reliever Darold Knowles, handed the ball to Lindblad in the bottom of the 9th after not using him in the ALCS or the first two World Series games. Every single pitch he threw could have won the game for the Mets. He allowed a ground rule double to Rusty Staub in the 9th, but after an intentional walk, worked out of the jam. In the 10th, he let up a single to Bud Harrleson and faced Willie Mays. Now of course Willie Mays was no longer the great player he once was. But all he needed was one swing against a journeyman left hander to put the perfect exclamation point on his career. Instead, Lindblad got Willie Mays to ground out. It was Willie Mays’ last at bat ever. Lindblad batted in the 11th and the A’s rallied to score a run. He took the mound in the bottom of the 11th before allowing a single to Wayne Garrett. Rollie Fingers finished the game and earned the save. But Lindblad earned the win, shutting out the Mets and denying the “You Gotta Believe” squad from a walk off win. As it turned out, the Mets did indeed win the next two games in New York but the A’s took the series in Oakland in seven games. Had Paul Lindblad faltered, the Mets may have won it at home and Oakland’s defense of the 1972 World Series would have fallen short instead of extending to 3 straight in 1974. Reggie Jackson won the MVP of the Series. Mike Andrews returned as a pinch hitter. But the series may have hinged on those two innings Lindblad threw. For that reason, he is the Unsung Postseason Hero we salute on October 16th. Today on The Sully Baseball Daily Podcast, I examine an intriguing “What If?” scenario. If the A’s developed in their new home with the same players who blossomed in the 1970’s, how would baseball have been different?